Bad girls burn hot . . .
And it's the color of fire. Fires that Kia can start . . . just by thinking about them. But inside, even the most vibrant shade of red doesn't stand a chance against the dark secrets of the Blackwood family . . . 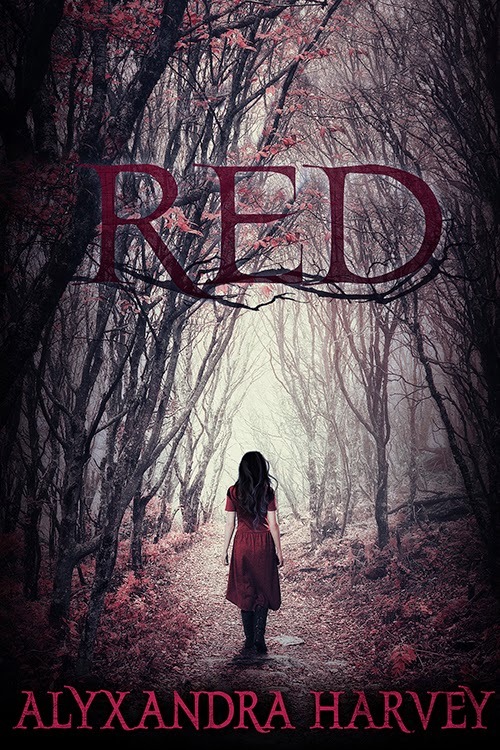 I've enjoyed everything I've read by Alyxandra Harvey (which includes pretty much her entire back list) so of course I was incredibly excited when I first heard about Red and I couldn't wait to read it. Unfortunately this was one of those cases where high expectations weren't quite met so while this is a quick and easy to read story I didn't love it as much as I had hoped to. Like a lot of people Kia has a temper, unfortunately her temper comes with an added problem that most of us don't have to worry about - she is a fire starter. No I don't mean she likes to commit arson, but she does have the power to start fires with her mind and it's an ability she has practically no control over. As soon as she gets annoyed things have a nasty habit of catching fire and she has developed quite a reputation because of it. After being kicked out of school Kia is given a fresh start when she is sent to live with her grandmother. Her grandmother is a housekeeper for the wealthy Blackwood family and Kia finds herself stuck living in their creepy old estate. She is sure something is going on but she has no idea how much danger she is actually in. I actually quite liked Kia's character, she is feisty and doesn't let anyone put her down. I loved the way she was able to stand up for herself against the would be bullies at her new school but it did get to the point where I felt her temper was a little over the top and I wanted to see her mature a bit. Unfortunately the other characters were cardboard cut outs, you had the mysterious, brooding hot boy who seems interested in Kia one minute and then pushes her away the next and, of course, you had the bitchy girl who wants the boy and is angry at the new girl because he seems to have taken a shine to her. There were other clichés in there too but I don't want to list them all here because it would take too long. Ethan's character never really caught my attention and I didn't have any interest in getting to know him which is probably a good thing because even now he is pretty much a mystery. I also felt that their relationship came completely out of nowhere and I didn't feel any connection between them. I think my main problem with the story was that there just wasn't enough background information given though. I wanted to know more about what happened at Kia's previous school, I wanted to know more about her mother and I wanted to learn more about her abilities. I also wanted to learn more about what was happening on the estate and the organisation that was behind everything. Even now I still don't understand why the parents of Ethan and his gang did the things they did, what their motives were or even how they ended up brought into the organisation that they worked for. I also didn't understand why they were allowed to get away with their behaviour considering that it seemed like the Blackwood estate was the only one that was run that way. There was so much potential when we started to discover what was going on but no matter how interested I was in all the different creatures we come across I wanted more information about how they all came to be there. At around 200 pages this is a fairly short novel and I think it could have done with an extra 50-100 pages to give us more background and so that more time could have been spent on character development. Don't get me wrong, Red isn't all bad. It was an easy and fun read and I think there is a lot of potential there if Alyxandra Harvey decides to turn it into a series but I don't think it was up to the level I expect from this author and I would recommend starting with her Drake Chronicles series if you've not read any of her books before.